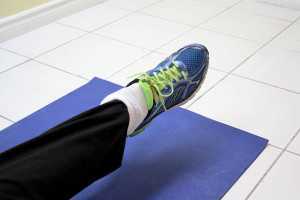 Experiencing foot or ankle stiffness or pain? Strengthening muscles around the joint help to decrease impact at the joint, and exercises may help maintain the ankle’s range of motion. Stand with feet hip-width apart, holding on to something for balance. Rise up onto your toes, lifting your heels as high as possible. Keep your upper-body tall. Hold for 2 seconds before lowering. Repeat 12-15 times. If you find this exercise easy, you can balance on one foot and do the heel raises using a single leg. Using just your foot and ankle, spell out the alphabet in the air. Sit on a bed or chair, with your feet flat on the floor. Place a towel on the floor slightly in front of you. Reach your toe out to the middle of the towel and grab the towel with your toes to curl it towards you. Relax and repeat 6-10 times per foot. Sitting straight in a chair, place a tennis ball or golf ball under the arch of your foot. Roll the ball under the arch of your foot for 2 minutes, before switching sides. From a seated position, with both legs straightened in front of you, loop a towel around the ball of one of your feet and hold each end of the towel with your hands. Pull the ball of your foot with the towel, flexing your foot towards you. Sit up tall and keep your legs straight.